Washington is considering letting Iran operate hundreds of centrifuges at a formerly secret bunker, in exchange for limiting research at other sites, US officials taking part in the nuclear talks in Geneva told AP. Instead of uranium, any centrifuges permitted at the Fordo facility would work on isotopes used in medicine, science or industry, the officials said. In return, Iran would scale back the number of centrifuges it currently operates at the Natanz facility, and accept inspections and other restrictions. 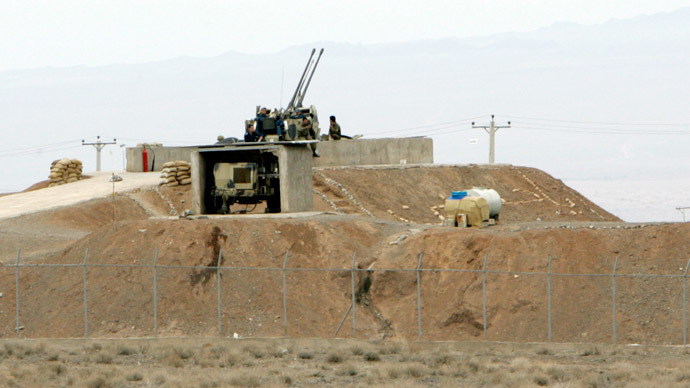 According to AP, the total number of centrifuges currently operating at Natanz is 10,000. If the leaked proposal is accepted, the combined number of centrifuges at both sites would be under 6,500. The formerly secret site at Fordo, which Iran revealed in 2009, is controversial because it is dug into a mountainside and fortified against air attacks. BREAKING: Officials: US considers letting Iran run nuclear centrifuges at fortified underground bunker. All of the proposed options are designed to keep Iran at least a year away from producing a nuclear weapon for the 10-year duration of the agreement, the officials said. Meanwhile, the White House has said that the US expects “tangible commitments” from Iran, but refused to confirm the agreement would be in writing. Led by US Secretary of State John Kerry and Iranian Foreign Minister Javad Zarif, the negotiators are trying to reach a preliminary agreement before the end of March. Deadline for the final agreement is June 30. Tehran disclosed the existence of the Fordo Fuel Enrichment Plant, unfinished at the time, to the International Atomic Energy Agency (IAEA) in September 2009. Iran said the purpose of the facility was the production of uranium enriched up to five percent of U-235, the isotope capable of sustaining a fission reaction. According to the Iranian disclosure, the facility was being built to operate approximately 3,000 centrifuges in 16 cascades. It is dug into the mountainside near the Shia holy city of Qom, 78 miles (125 km) southwest of Tehran. The extensive facility at Natanz, whose existence was revealed in 2002, is in the Isfahan province, 204 miles (328 km) southeast of Tehran. It is reportedly eight meters (approx. 26 feet) underground and extends over 100,000 square meters, with a capacity of 19,000 centrifuges. “We will continue 20 percent enrichment at Fordo and Natanz to meet our needs,” Atomic Energy Organization of Iran Director Fereydoun Abbasi told the Tehran Times in January 2013, a year after one of the Natanz scientists was killed in a car bombing that Iran blamed on Israel. The US, Russia, China, Britain, France and Germany – known as the “P5+1” – are trying to reach an agreement with Iran to restrict the country’s nuclear program in return for lifting the economic blockade imposed by the UN. The Obama administration has come under criticism by the Republican-led Congress over the Iran talks. Earlier this month, Israeli PM Benjamin Netanyahu was invited to address Congress without White House approval, and blasted the talks in his speech. Days later, 47 Republican senators sent a letter informing Iran that any deal would be invalid without their approval. Iranian President Hassan Rouhani has likewise come under criticism by political opponents who do not trust the US to honor any agreement.